Shimpo's Potter's Wheel is extremely responsive, with high torque at all speeds. It's powerful, and by far the quietest pottery wheel on the market. The ½ HP, brushless DC motor has a direct drive (no belt) system and a broad speed range for optimum control. A fixed foot pedal with hand lever operates the electronically controlled motor. The motor is reversible for lefthanded and righthanded users. The 12" wheelhead and two-piece splash pan are standard. Centers up to 100 lbs. The wheelhead also turns freely, so it can be used as a banding wheel at 0 rpm. 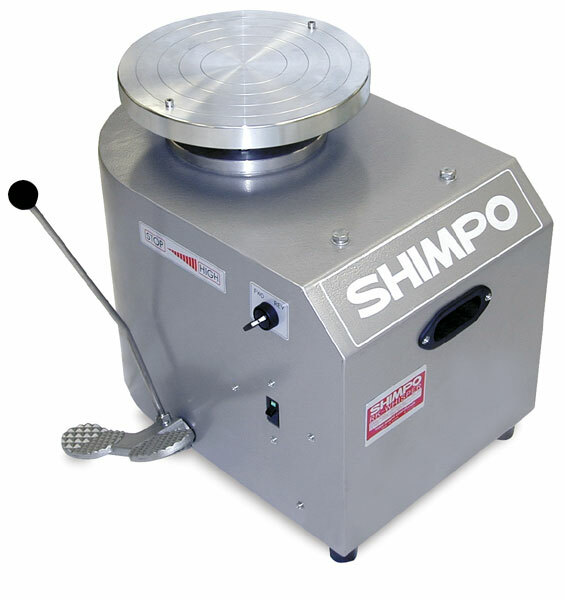 To view a PDF of the Instruction Manual, including warranty information, for the Shimpo RK-Whisper Potter's Wheel, please click here.